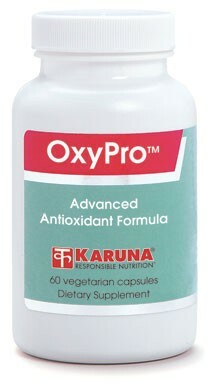 OxyPro is formulated with a base of free radical-quenching nutrients, plus additional vitamins, trace minerals and amino acids required for activation of the radical-scavenging enzymes superoxide dismutase (SOD) and glutathione reductase (GPx). This formula offers a more reliable approach to antioxidant enzyme support than enzyme-containing formulas having questionable absorption. Refer to About…Vitamin C and E-400. Natural beta-carotene possesses superior antioxidant activity compared to the synthetic beta-carotene more commonly found in vitamin supplements (Amer J Clin Nutr 1996;63:729-34). In a controlled trial, a combination of supplemental beta-carotene and vitamins A, C and E helped protect myocardial tissue from the effects of ischemia (Am J Cardiol 1996;77:232-6). Zinc, copper and manganese are required for activation of superoxide dismutase (SOD), the enzyme responsible for scavenging harmful free radicals (FASEB J 1987;1:441-5). Superoxide dismutase itself is not effectively absorbed as an oral supplement (Am J Clin Nutr 1983; 37:5-7; Biopharm Drug Dispos 1996; 17:165-74). Selenium, the mineral activator of glutathione peroxidase, has been associated with cardioprotective effects (Int J Epidemiol 1990;19: 918-22) and other long-term health benefits (J Natl Cancer Inst 1998; 90:1219-24). N-Acetyl-L-Cysteine, L-methionine, and glutathione are sulfur amino acids that participate in antioxidant mechanisms utilizing donor electrons available on sulfur atoms (Clin Sports Med 1999;18:525-36; Altern Med Rev 1998;3:114-27). Suggested use for adults: Two capsules daily, taken with meals, or as directed.